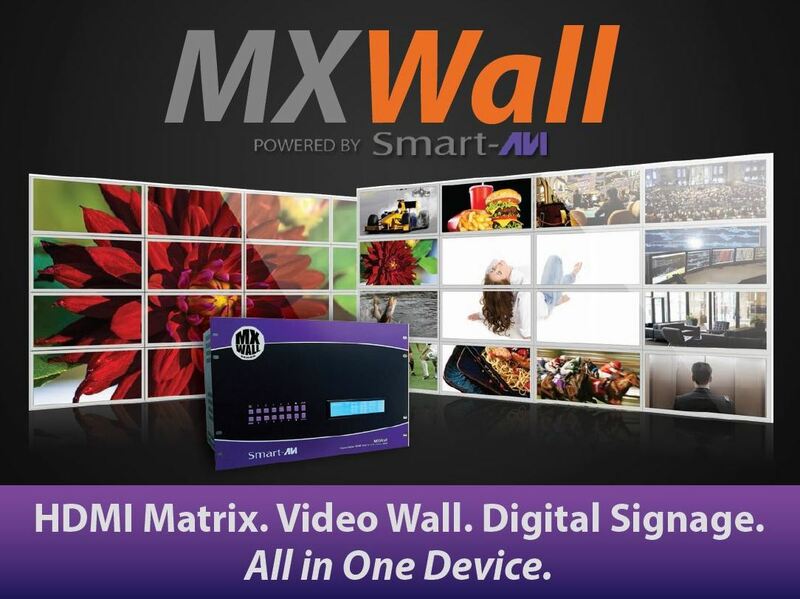 Accessing the power of a Digital Signage Network has never been easier. 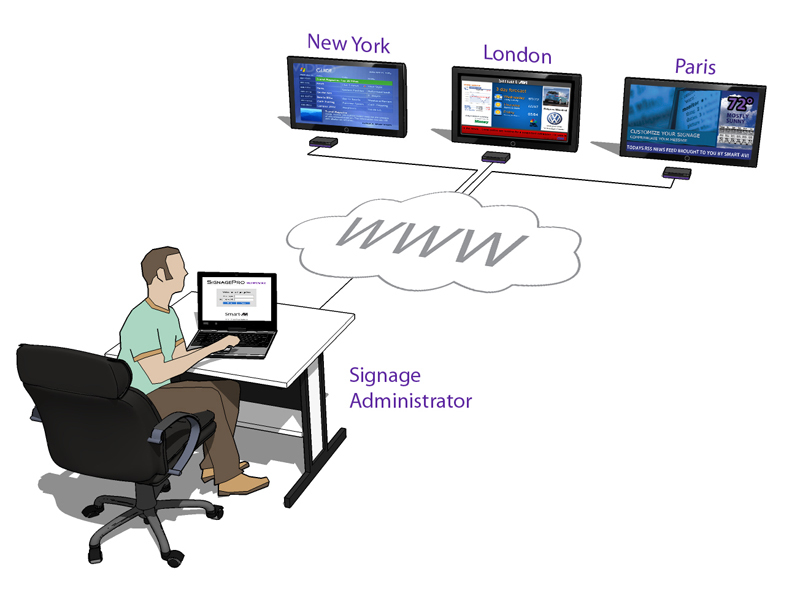 How can your business benefit from a digital signage network? 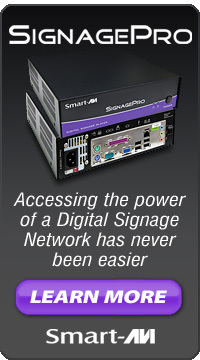 SignagePro makes creating your own digital signage network easy. SignagePro is one of the most cost effective products of its kind on the market. But don’t let the low price fool you. SignagePro has all the features, dependability, and scalability of products costing several times as much. From start to finish, you’ll be creating your own presentations in about an hour. Even the most non-technical users can follow our easy-to-use, step-by-step, illustrated instructions. If you do run into problems, we have fully trained support staff on hand to guide you. We developed SignagePro to be used by everyone, not just the IT department. Our intuitive Windows-based interface will get you building your digital content like a professional in no time. Increase sales with enhanced point-of-sale promotions. Educate your customers with product demonstrations. Enhance employee training and communication. Offer information and directions for large buildings and campuses. Generate revenue from third party advertising. Offer live news and data streams. Categories: digital menu, digital signage, digital signage hardware, digital signage software, signage digital, Uncategorized | Tags: digital signage, digital signage hardware, digital signage software | Permalink. The complete, affordable, and expandable digital signage solution. Software included and no recurring fees. 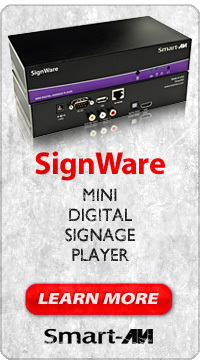 SignWare is a comprehensive digital signage package that is very affordable and fully expandable. It is manageable from any location on the planet, whether you have one or one thousand signage installations. SignWare offers crisp high-definition 720p/1080i HDTV video combined with stereo audio in a conveniently small package. The unit comes bundled with a simple yet powerful software package with no recurring fees. SignWare supports several different media types including 720p/1080i HDTV video with high-fidelity stereo audio, RSS Feeds, AVI, WMV, GIF, Animated GIF and JPG. Using the included software, media can be configured to display in different zones on the display and at different times. With the tools included in the SignWare package, each display can be specialized to reach the target audience more effectively. Expand your signage network up to 1,000 players! Categories: digital menu, digital signage, digital signage hardware, digital signage software, signage digital, Uncategorized | Tags: digital menu, digital signage, digital signage hardware, digital signage software, video wall | Permalink. The Complete, Affordable and Expandable HD Digital Signage Menu System. Software included and no recurring fees. SignWall makes it easy to create and maintain a dynamic high-definition menu board. Designed for use with up to four high-definition displays, SignWall is a comprehensive menu board solution. At the heart of the SignWall system is a powerful digital signage processor. Combined with SignWall’s included software it is simple to create an eye-catching dynamic menu board. Use a broad range of media types including video, images, PowerPoint, Flash, PDF, Excel and more to create your dynamic HD menu board. 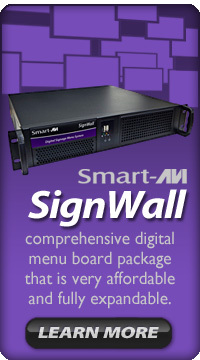 SignWall is a comprehensive digital menu board package that is very affordable and fully expandable. It is manageable from any location on the planet, whether you have one or one thousand installations. 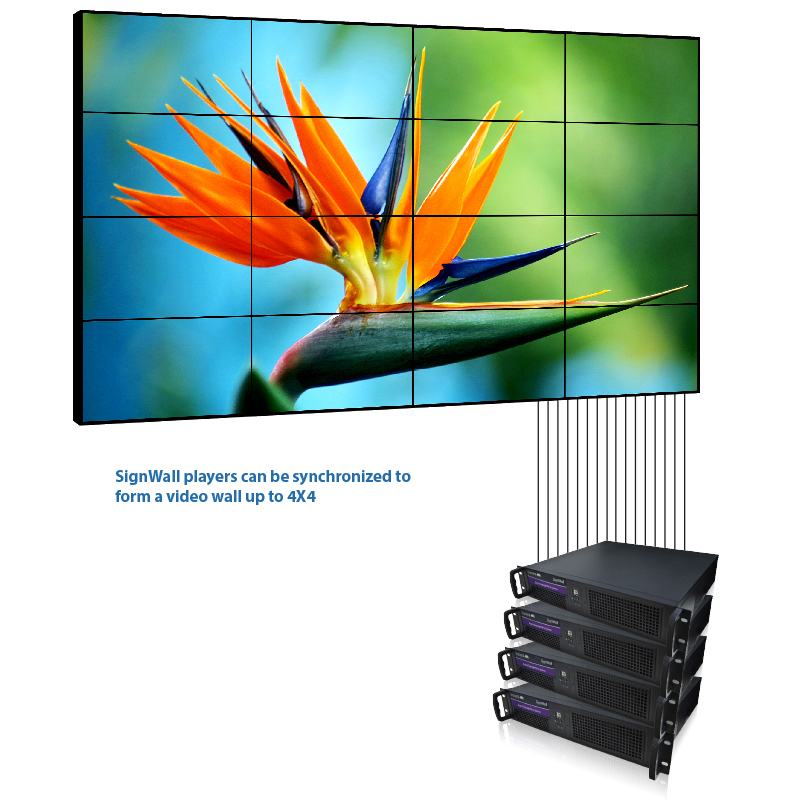 SignWall offers crisp high-definition 1920×1200 HDTV video output to up to four displays. SignWall comes bundled with a simple yet powerful software package with no recurring fees. The SignWall player comes pre-loaded with menu templates. Each template has customizable menu zones, schedules and content. Zones allow multiple types of content to be displayed on the screen at the same time. Schedules can be customized to play content based on a delivery schedule, allowing menu items to be changed throughout the day. The SignWall player is accessible from anywhere in the world, and menu items can be changed remotely. SignWall is powered by a blazing fast Intel Core i5 or Core i7 processor with 4GB of RAM and a Solid State Drive (SSD). 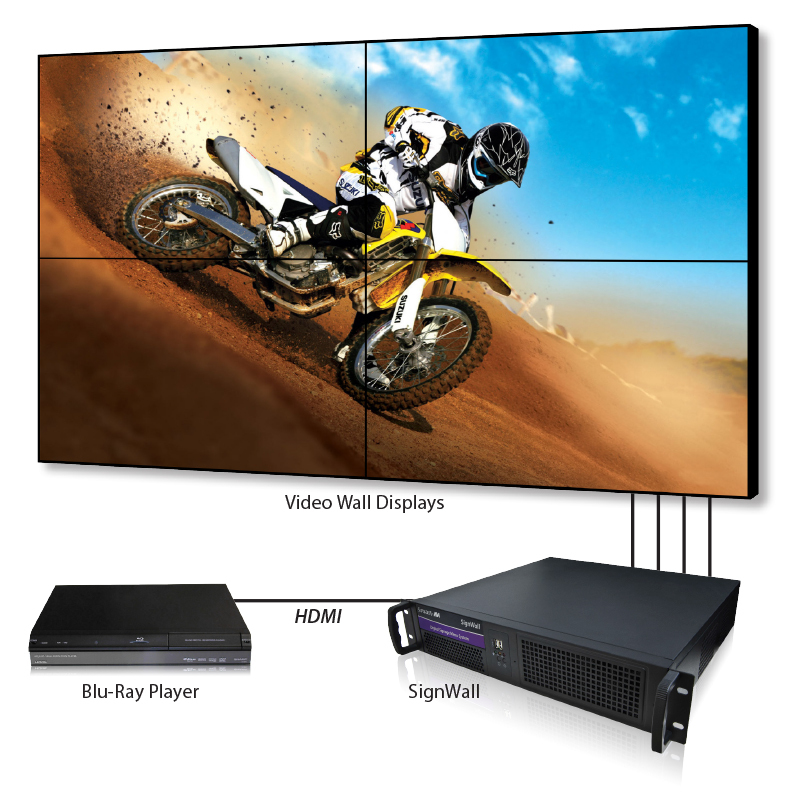 This combined with a VisionTek AMD Radeon™ HD 5570 1GB SFF 4-Port DVI-D video processor gives SignWall the power to display seamless full HD 1920×1200 video on 4 displays. SignWall can easily create a video wall up to 1,000 players!